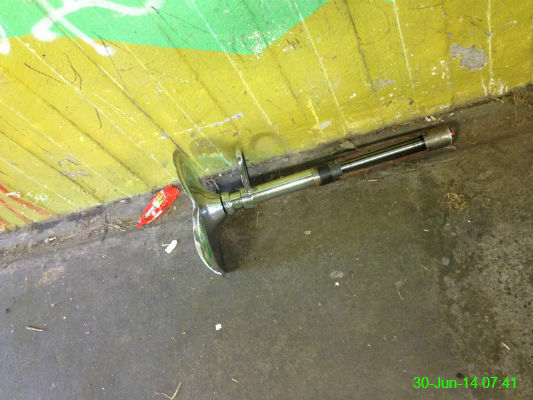 Our local underpass can always be relied on for accumulating unusual items and this broken bar stool is the latest feature. 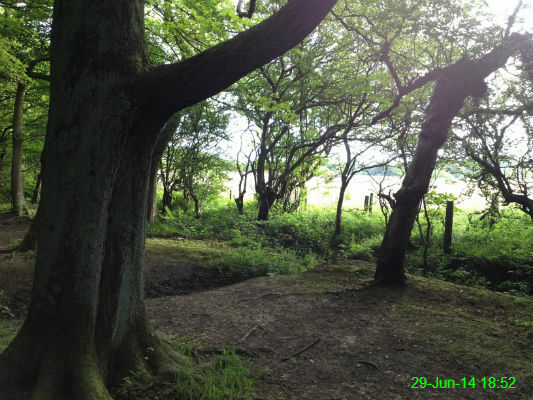 The sun seemed extremely bright on the other side of the trees as we walked around Gosforth Park. 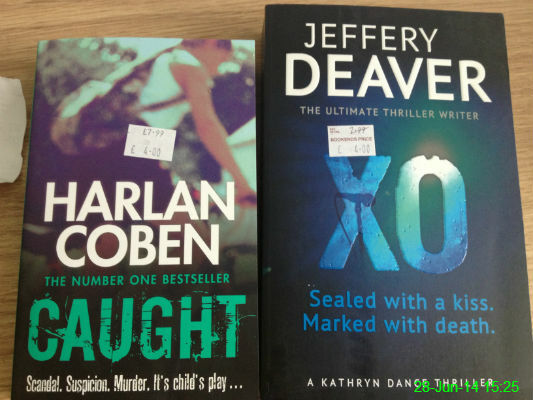 I couldn't resist popping into a book shop yesterday and picking up a couple of cheap thrillers. £26.10 for two return tickets to Carlisle seemed reasonable so we got the train along for the day. 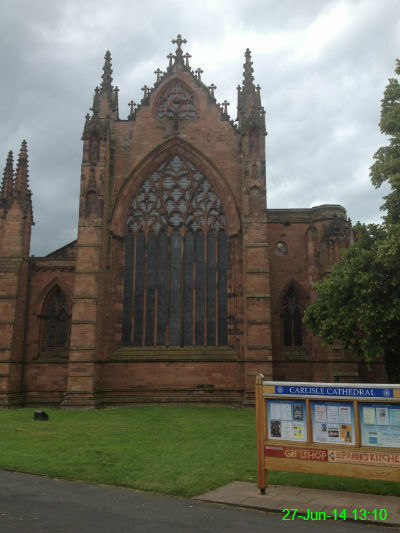 I think we managed a token amount of sightseeing before ending up in the pub! 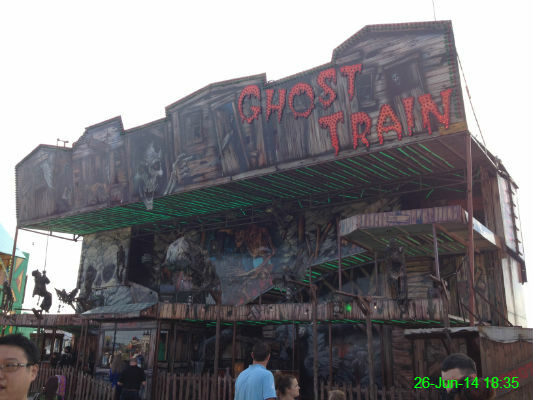 The Hoppings is back on the Town Moor and this truly dreadful Ghost Train was the fastest ride I ventured on. 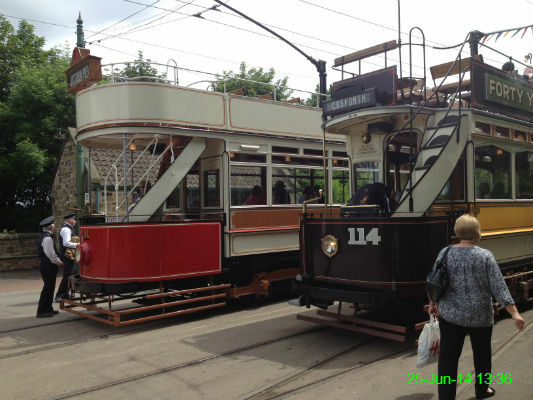 I've been wanting to go back to Beamish for years so spent today reliving my childhood with a good wander around. 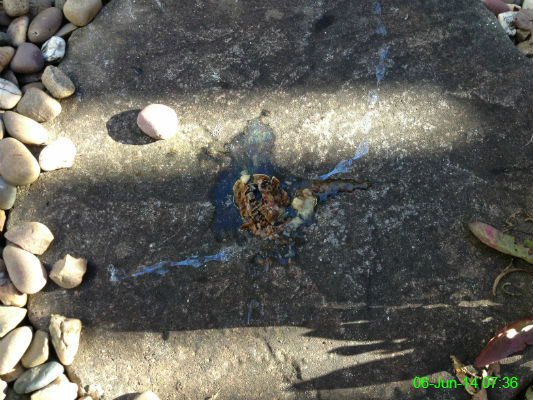 It was very good, if a little unusual because one of the rabbits dropped down dead right in front of us, after I'd just eaten rabbit casserole for the first time at the nearby Shepherd & Shepherdess pub! 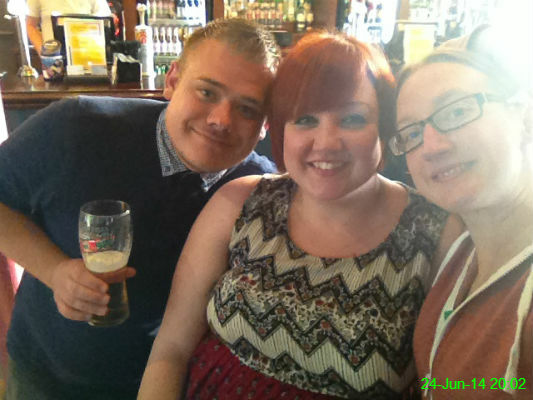 I turned 29 today and celebrated with Michael, Alison and a few pints of cider. Another year older but probably not any wiser. 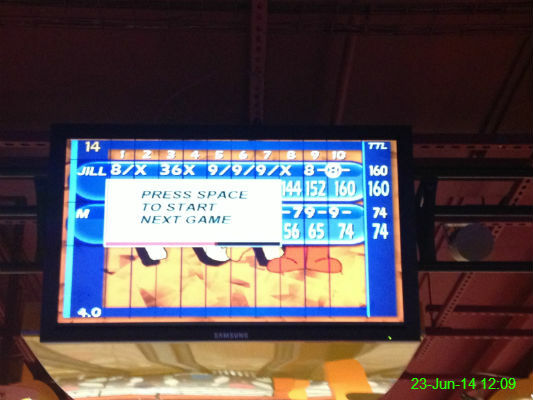 It's over 4 years since I last bowled but after our first game this afternoon it felt like I'd never been away. I think this might be one of my highest ever scores. 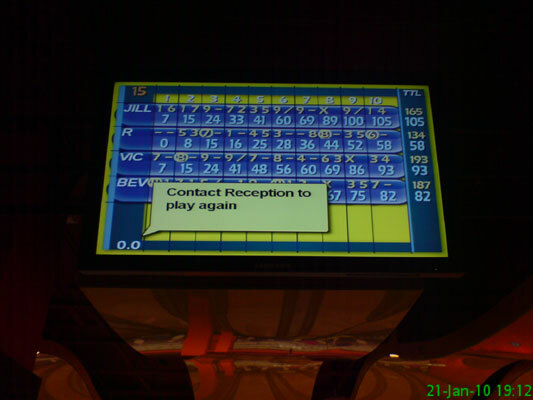 I wasn't quite as skilled in the second and third games but managed an overall win with a score of 389 to 307. 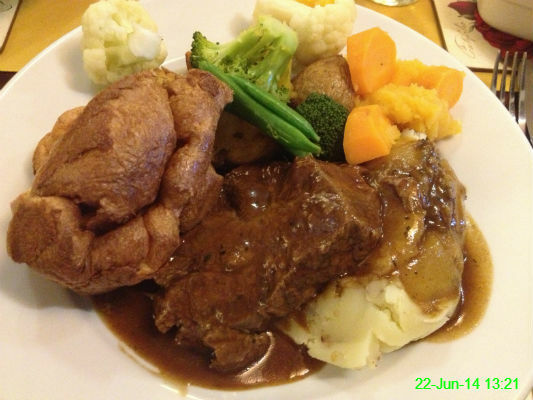 Possibly the best Sunday dinner I've ever had*, from The Black Bull in Wylam. Featherblade of beef in ale with haggis mash. It was the first time I've tried haggis and I absolutely loved it. *That wasn't made by my mam, of course...! After walking to Tynemouth via North Shields (around 9.5 miles) we rewarded ourselves with chips and a visit to the new Head of Steam pub which opened here recently. 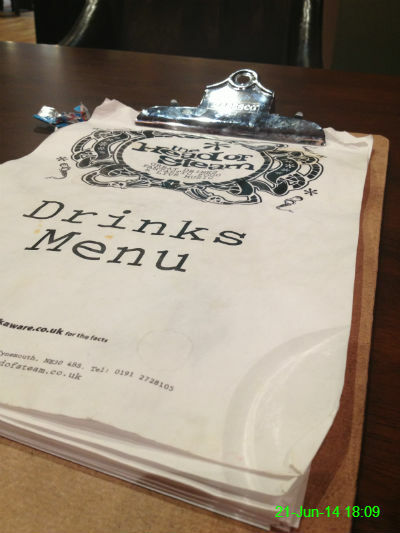 Verdict: way too much choice on the drinks menu! If we weren't only staying for one my bank balance would seriously suffer. 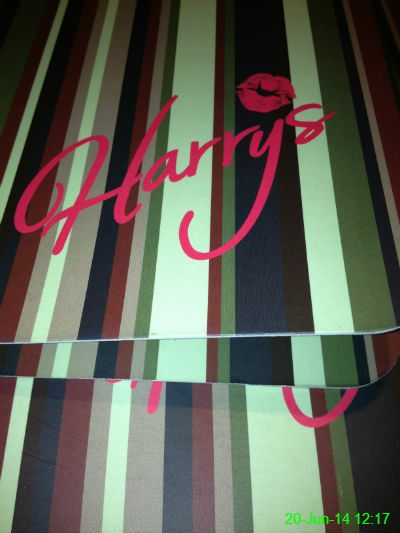 I went out for lunch with Nicola to Harry's Bar, which has recently opened on Grey Street. It was very nice and I'll definitely be going back to try other things from their menu. I went to the Academy with Mak, James, Nicole, Michael and Matt to watch England play their second group game against Uruguay. 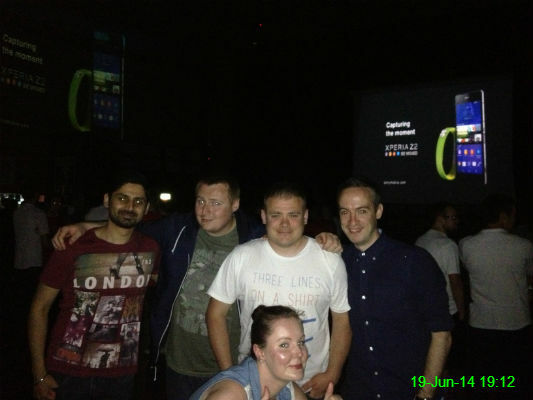 The smiles didn't last long as Englanad lost 2-1 and we all ended up drenched in Carlsberg. 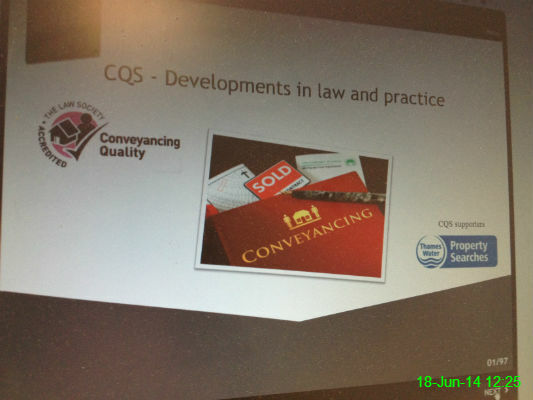 A requirement of my job is to complete regular training courses. This one was pretty long (note the bottom right corner: I am on page 1 of 97!) and the test more difficult than many but I did manage to pass. 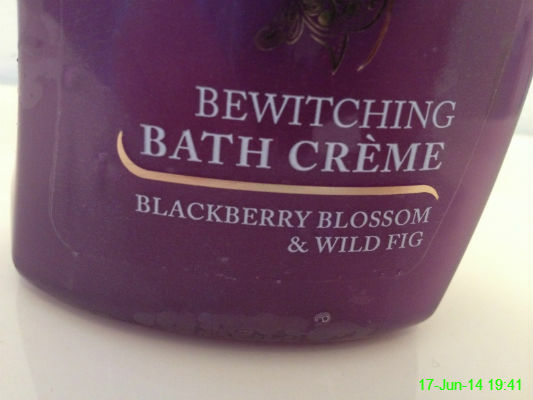 It seems a strange choice of word to describe a bath creme that, to my nose, just smells vaguely like a bakewell tart. I also bought these, which I haven't worn yet since I don't think they would go with the shorts I was wearing yesterday. 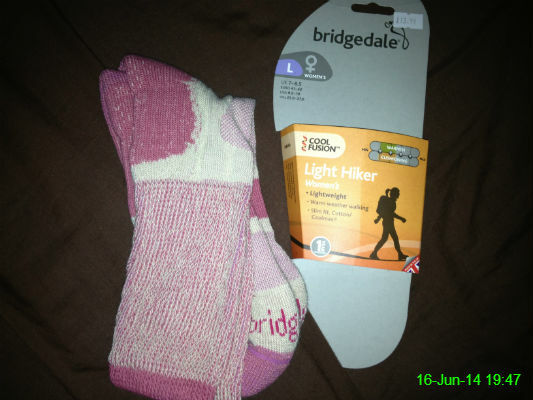 I bought these yesterday, so we went for a 7.5 mile walk through Burradon, Dinnington and Hazlerigg to break them in. 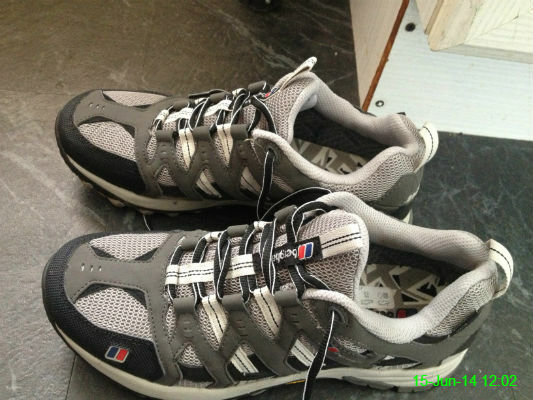 Very comfortable and springy! 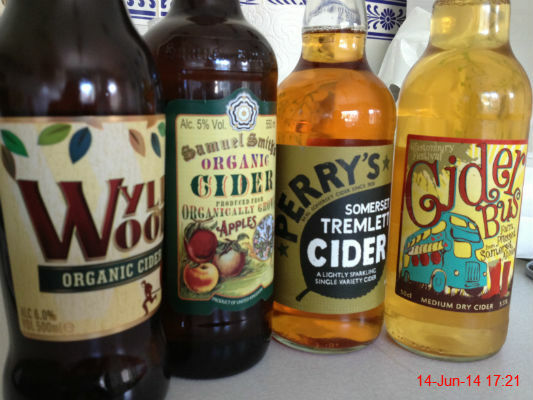 A continance of the patriotic theme, this time with ciders. I drank these to wash down steak and ale pie before watching England's first game of the World Cup. Unfortunately they lost 2-1 to Italy, but fingers crossed for better in the next match. 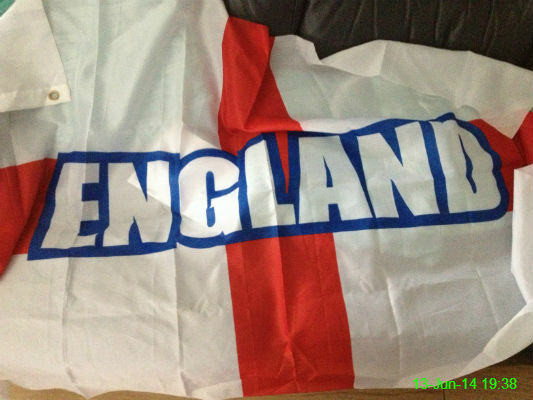 My patriotism is increasing by the moment with England kicking off their World Cup campaign tomorrow against Italy. I was going to hang this up somehow but then I remembered it's Friday the 13th so I don't think a clumsy oaf like me should be attempting anything of the sort! I had another voucher for a free drink at the Pitcher and Piano. 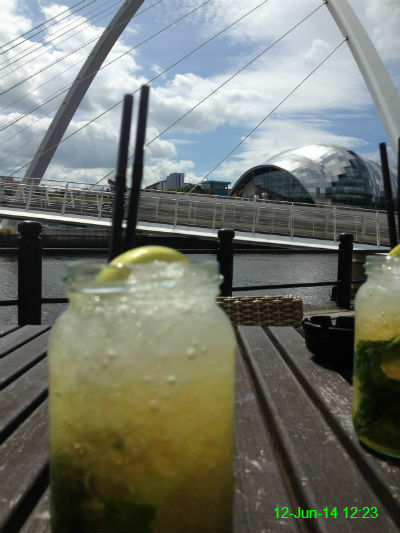 This time it was a mojito, which I enjoyed in the sunshine overlooking the Millennium Bridge. 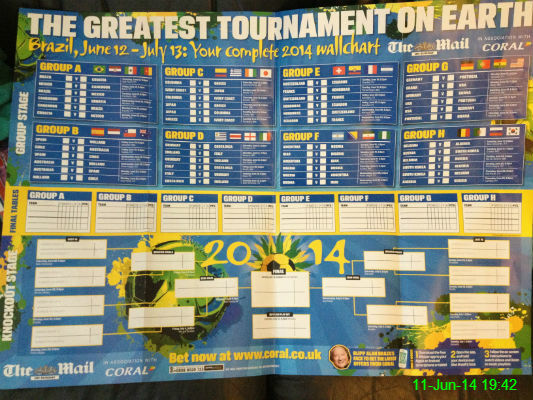 Despite spending most of the last season wishing I hated football, I'm now excited for the World Cup to start! I don't have much longer to wait since the first match takes place tomorrow. 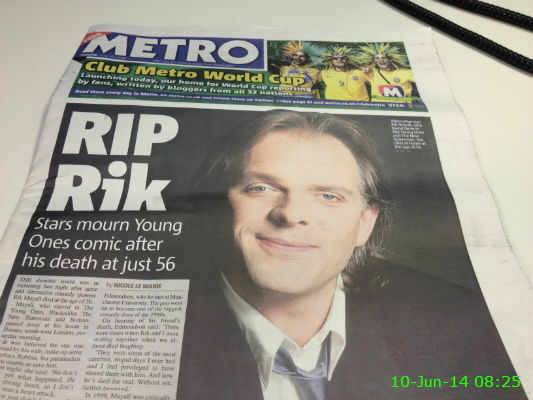 I'm a big fan of a lot of Rik Mayall's work, in particular The Comic Strip Presents and Bottom, so I was saddened to hear of his death yesterday. 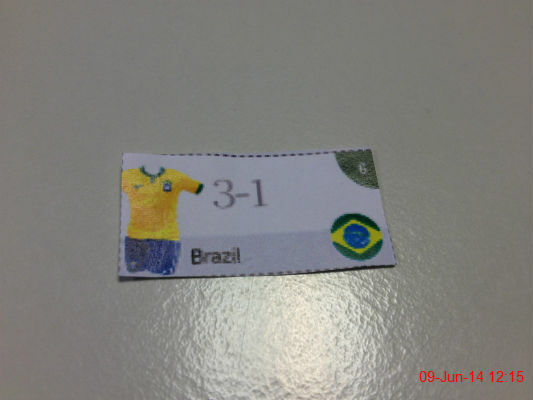 Finally I get something in a sweepstake at work which accidentally stands a chance of winning. 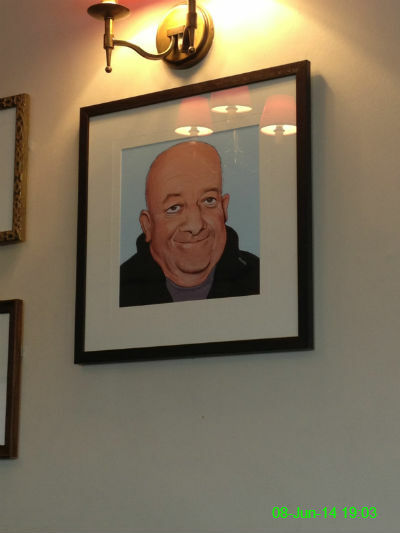 I can only assume this picture in the Black Bull at Benton is supposed to be Tim Healy. If so, it's a reasonable likeness. Otherwise, I'm stumped. 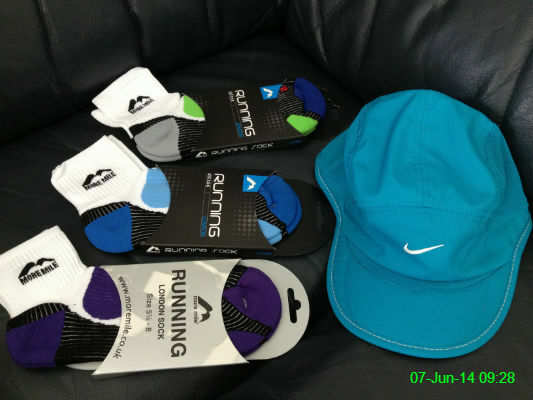 I visited Start Fitness yesterday and bought a hat and some socks for running. 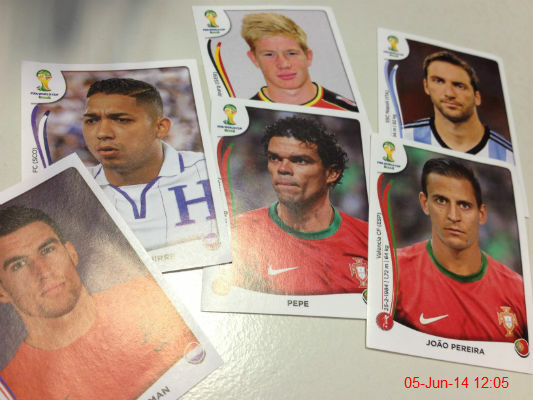 I haven't been collecting stickers for the Panini World Cup album but I ended up with these. I'm hoping to pass them on to someone else soon because Pereira's stare is giving me the creeps. I've never used any of this sort of thing for long runs but I suddenly remembered the sample pack which I received in my finisher's pack after the Great North Run last year. 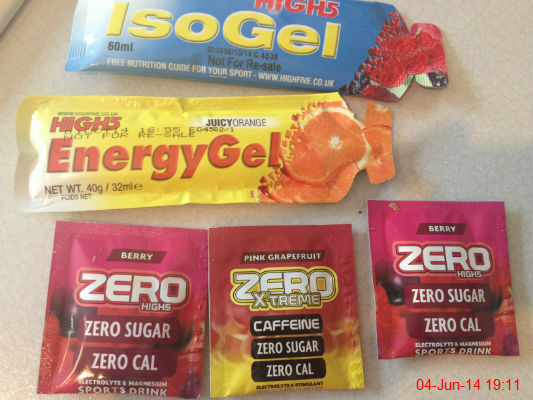 I have to say the sachet which mixes caffeine with pink grapefruit sounds guaranteed to make me vomit regardless whether I've been running or not! 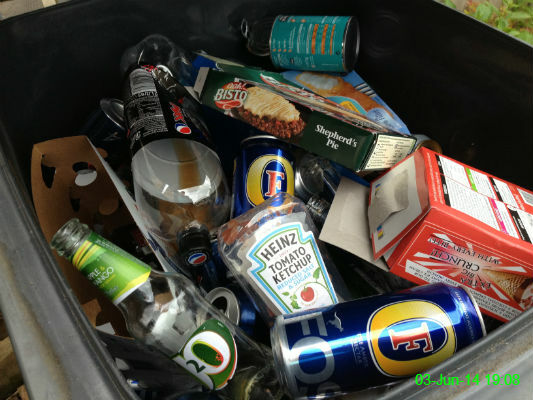 Since we had company over the weekend and had also cleared out some boxes, plastic and other bits and pieces our recycling bin was extremely full. I tried to hide most of the alcohol containers but it still clinked all the way down the drive and attracted a raised eyebrow or two from the neighbours who were out in the street. 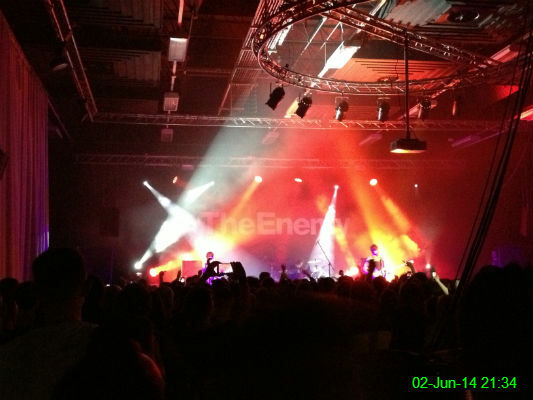 At the last minute we ended up with tickets to see The Enemy at Northumbria University. Thanks to festivals and support for other bands I seem to have seen this band a disproportionately high number of times compared to bands I like a lot more, but they always put on a lively show and tonight was no exception. I tried golf for the first time today. 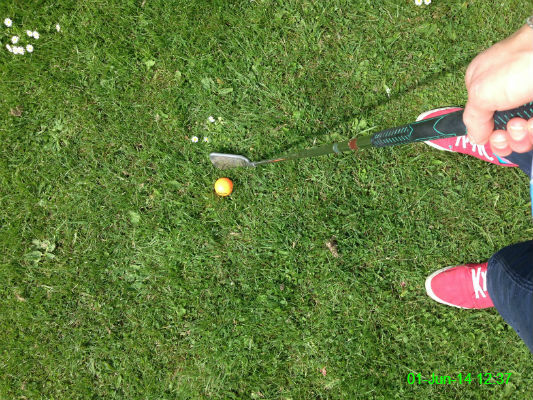 It took MANY attempts before I could even hit the ball! I did manage a few decent shots in the end, one of which unfortunately managed to lose a ball.